And what's more, you're ugly! Adam Hanft dissects and deconstructs political advertising at Spin Season, where this originally appeared. Rummaging through the ugly archive for the most unflattering photo of your opponent, and making aesthetics a strategy, has long been a tradition of political advertising. Carl Paladino, who won a stunning victory over Rick Lazio in the New York Republican primary, and, depending on the poll you believe, is closing the gap with Andrew Cuomo, has clearly elevated the art of visual combat with this image. It’s destined to become a Photoshop classic. Cuomo has just launched his first attack on Paladino; as a sitting attorney general who needs to maintain a modicum of decency, he can't turn to junior high school election campaign tactics. But check out the image of Paladino he chose: It makes the man look like something between a fugitive pederast and a crazed seller of kitchen-cabinet refinishing services. Over in California, Meg Whitman isn’t just making Jerry Brown ugly, she’s cleverly making him look as geriatric as possible, using ancient newspaper photos that seem like they were shot contemporaneously with the San Francisco earthquake. Reminding us that he’s been around forever –- that he is a serial failure –- is central to her strategy. Meanwhile, in the California Senate race, we have an unofficial but brutal how-ugly-can-I-make-you competition. Carly Fiorina is running a beat-up Barbara Boxer spot that ends with an image of the senator that the media has called "unflattering." Similarly, Boxer’s spot, which lambastes Fiorina for shipping jobs offshore, uses images that are being described in exactly the same way. And let’s not forget Fiorina’s open mic problem back in June, when she mocked Boxer’s hair as "Sooo yesterday." Note to candidates: Always keep a Red Bull tucked under your seat. Loretta Sanchez, a Democratic congresswoman from California, is locked in an ugly race with Van Tran, an assemblyman. So how happy were her media buzzards when they found this photo of a snoozing, nearly drooling Tran? Of course, they used it to pay off a spot that lists all of California’s woes, followed by the inexorably obvious comment that Tran is "sleeping on the job." 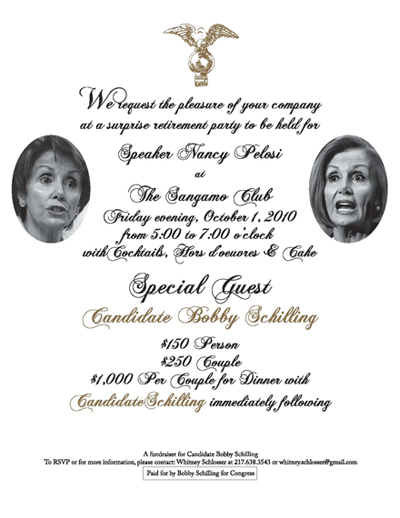 Perhaps the most visually mocked national figure these days, though, is Nancy Pelosi, who is used incessantly as a synecdoche for all that is evil and twisted about the Democrats. And jabs about her alleged Botox addiction are everywhere; even Jon Stewart said, "Does Botox also paralyze your moral compass?" after she defended Charlie Rangel. Which leaves me constrained to point out that male political leaders aren’t mocked in the same way for their dye jobs and other efforts to make themselves intern-ready. Lastly, here’s a real treat, a rarely seen candidate-on-candidate example of ugliness. It’s a caricature of Bobby Kennedy, sketched by Lyndon Johnson himself during the presidential campaign of 1960. 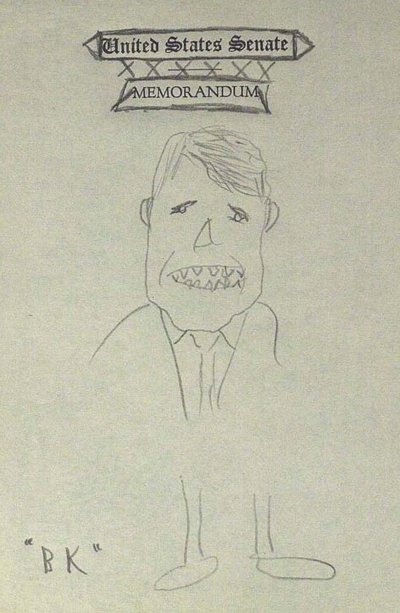 I love the auctioneer’s neutral description: “LBJ’s caricature depicts an unflattering image of RFK with shark-like teeth and scrawny legs.” Note that the estimate was between $5,000 and $8,000, but the reserve wasn’t met. Adam Hanft writes and comments frequently on politics and culture for The Daily Beast, Fast Company, Huffington Post, CNN, Fox News, Politics Daily, the Barnes & Noble Review, and elsewhere. He is founder of Hanft Projects, a strategic and brand consultancy.